With stylish celebrities like Emma Watson, Michelle Williams and Katie Holmes rocking pixie cuts, bobs and other close-cropped hair styles right now, short hair is clearly one of the hottest trends for 2012 -2013. Whether choosing a high-fashion asymmetrical cut or a simple, classic pixie or bob, every woman can find a short hairstyle that is right for her. Popularized first by actress Mia Farrow and model Twiggy in the 1960s, the pixie cutis back in a big way in 2012, with stars like Carey Mulligan and Ginnifer Goodwin sporting this classic look. This is one of the shortest of short hairstyles, featuring closely-trimmed hair on both the top and sides of the head, with slightly longer hair along the back and nape of the neck. The pixie cut accentuates delicate facial features, and can be cut to be appropriate for women of any age or face shape. To be on trend for 2012 – 2013 season, pixie cuts should be styled with a little bit of texture or tousle for a softer, more feminine look. The bob hair is another short hairstyle that has never gone out of fashion. Beginning as a signature style for the flappers in the 1920s, the bob still stands as a fashionable statement for women wanting to look cutting edge. A bob typically features hair cut in a straight line around the head, usually at about jaw-level. Bobs can also be cut on an angle with a shorter back for an edgier, more unique style called an A-line bob. Although straight-across bangs are a hallmark of the classic bob, soft, side-swept bangs along with deep side parts are currently showing up as stylish variations of the look for 2012 -2013. For women with curly, wavy or textured hair, another fashionable style option for 2012 is the messy shag cut like the one sported by fashionista Alexa Chung. This kind of cut is chopped straight around the head just below the chin. This cut should be styled naturally, with loose, air-dryed curls and waves, rather than flat-ironed or straightened tresses. 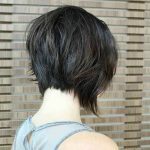 This easy, breezy haircut is one of the most current styles for 2012 – 2013, and it can be worn by both young, hip women and more mature women who favor a casual, natural look. The most daring and bold women may want to adopt an edgier, asymmetrical cut. For 2012, stars like Rihanna and Pink are flaunting super short haircuts that feature buzzed-off chunks, and razor-cut spikes. The variations for this kind of look are endless and can be customized to best suit a woman’s unique facial features. 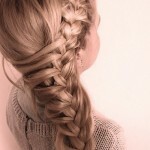 This kind of style works best for younger women who can rock a modern, asymmetrical look with confidence and poise. For women trying to look fabulous and fashionable in 2012, short hairstyles are a great choice. Whether a classic bob or pixie, a simple but unique shag cut, or an edgy and asymmetrical crop, there is a short hairstyle to fit the fashion sense of every woman. Don’t love these short haircuts? Check the top 10 popular short hairstyles.